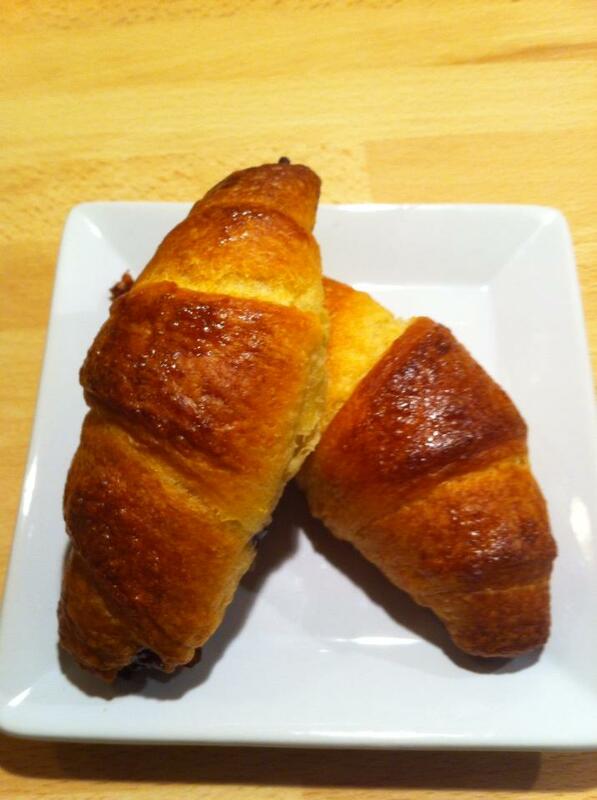 Here is my recipe for Croissant . It is so easy to do and it will be so good. Think of putting teeth into fresh, warm baked Crossiants . I usually fill them with Nutella or jam of any kind. Heat the water and the milk is lukewarm. Crumble the yeast into a bowl and stir it with the liquid. Add salt, sugar and almost all the flour. Working together to form a smooth dough. Let the dough rise for about 2 hours with the lid on. Remove the dough and work it. Place back in the bowl. Let rise in refrigerator overnight. Place the dough on a floured surface and roll it out into a thin cake. Cut the cold butter into thin slices with slicer. Put them on half the dough and fold over the other half. Roll out the dough again and fold it so that it becomes 3 dough layers. Roll and fold about 20 times. Divide the dough into 2 pieces and shape them into balls. Roll them into thin round cakes, about 30 cm in diameter. Cut each cake across into 8 triangles. Roll up them towards the tip. Warp bit in the dough so that the snib is on the bottom. Place the croissants on a baking sheet with parchment paper. Covered for 1 hour. Preheat oven to 225c. Brush the croissants lightly with beaten egg. Bake them golden brown in the oven for about 15 minutes. Let croissants cool on a rack without a kitchen towel. We’ll have to try these out (especially in our La Cornue oven)! You make it seem so easy. I’m inspired! I’ve pinned it for later use. Thank you.